We are unsure as to who has made this gorgeous doll. She has been very well made and her outfit has been made very professionally. She is wearing a very pretty dress which has a black velvet bodice with long sleeves and a burgundy see through nylon skirt with gold thread in it. She has a black velvet bow in her hair. She has a blonde long curly wig which has a fringe at the front of her face. She has open blue eyes with fringed eyelashes to both eyes, a closed pink mouth and blush to both cheeks. She has a porcelain head, neck, 1/2 porcelain arms, 1/2 porcelain legs and a slender fabric stuffed body. Her outfit consists of a gorgeous dress with cream satin type lining, lace edged long white pantaloons, long black socks, and black Mary Jane type vinyl shoes. She also comes with the brown wooden doll stand. Rianna is a lovely doll in her lovely vintage drop waisted blue and lace trimmed dress, and is holding her little teddy bear friend. She has been made by a doll artist, and has her name and doll mold underneath the back of her hair. This is a very pretty reproduction antique China Parian Doll head and bust with a material base on a round wooden base. She is made from shiny porcelain with painted facial features. 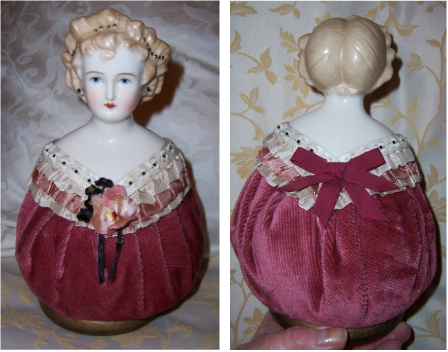 A very pretty China shoulder head Parian reproduction doll. Tea time for Emma is from the Georgetown collection and was designed by Brigitte Deval. .Emma's head cannot be moved to different positions.
. blonde glued on upswept wig. 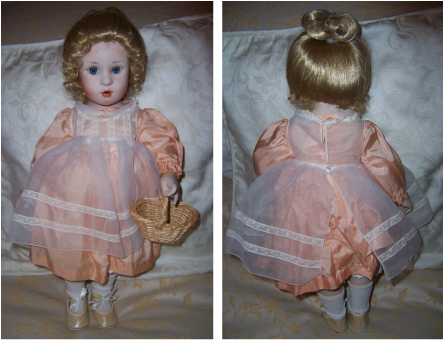 She is wearing a pretty silk peach dress with a cute white pinafore, underskirt (elastic has loosened over time) and pantaloons. Not sure if she ever came with socks or shoes but she has white socks and cream shoes on her feet. We have also given her a wicker basket as she had lost her original one. She is missing her cups and saucers and tablecloth. She comes with no COA, no box or doll stand.